NOTES: Several weeks ago, I read about a magical concoction called salted caramel frozen yogurt. I tried not to think about it. But I couldn’t shake the idea of cold, sweet frozen yogurt, flavored with salted caramel. So one night after work, I waded through humid summer sidewalks to Pinkberry. The line inside moved quickly, and the employees were super friendly. That’s all beside the point. 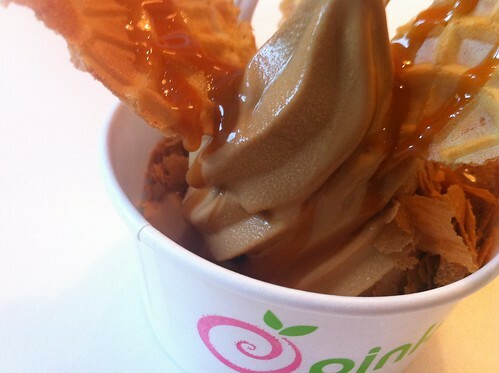 Let’s discuss the amazing deliciousness that is salted caramel fro-yo. I don’t know if it was the yogurt alone, or the combo of the sauce and crisp toppings, but I have one word, and three letters: y-u-m. Was it salty? Not outright. The idea of salted caramel is that a hint of salt draws out the sweetness of the caramel, and that’s certainly the case here. The real question: Is this worth $5 (for a small, to boot)? I say this is an indulgence you should try at least once in your life. The bad news for you? They’ve changed their seasonal flavor to PB+J. I would give salted caramel fro-yo two thumbs up, but my hands are busy typing this review and wiping drool off my chin.